I grew up in the San Francisco Bay Area and recently graduated from Baylor University. I am now in graduate school at UNT studying Audiology. In my free time I enjoy taking my black lab, Paisley, to the dog park and attending Baylor sporting events. I previously taught at a swim school in the Bay Area for the past 7 years. 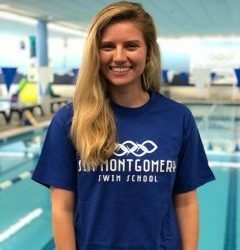 Now that I have moved to the Dallas area, I like working at JMSS because I have always loved to swim and be around kids. Swimming is such a vital life skill, and I love teaching it.